Ever sit down and list all your tasks as a blogger? Chances are, it’s no small list. You do a lot just to write and promote a single post. As a blogger I think about my skills all the time. There’s so much expected of me. So much, in fact, it inspired me to sit down and list all the skills I learned as a blogger and think about the places it could take me. Here’s the fun part…the things we learned as bloggers are skills- the skills needed by big and small businesses alike. Many are launching successful blogging and social media campaigns and need experienced people to run them. That’s where this e-book comes in. I’m not going to lie. There are no secrets in this short book. There’s nothing here you can’t figure out on your own. The purpose behind this 23 page e-book is to inspire you to take the skills you learned as a blogger and use them to propel you bigger and better things.You’re not guaranteed a job upon completion of your reading, but you may be inspired to seek out a new career. I just want you to think, and if you work hard enough, make a lucrative career choice. Several years ago I was working as a blogger for several different networks. I love blogging and all that comes with it, but I wondered how I can take it to a whole other level and make it into something more profitable. So I started checking the job boards. I came across a job for Community Manager that listed all the things I loved doing best – blogging, social networking and yes, hanging out on Twitter. Next thing you know, I’m the new Community Manager for the popular online social radio community, BlogTalkRadio. My story isn’t unique, either. Are you interested in exploring the world beyond blogging? I’ve written a short e-book detailing the possibilities and giving you some things to think about. 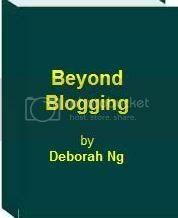 Beyond Blogging: Using Your Blogging Skills for Bigger and Better Things is about realizing your potential, and using it to your benefit. In addition to suggestions as to the types of jobs and careers you look into, Beyond Blogging will also show you a few places to look. At only $9.95, I hope it’s a both bargain and a valuable reference. Okay out there in cyberspace. I have been so trying, so hard to link up with writing tuturials and now some paying markets and am still trying. tomorrow i GO FOR A free resume writing workshop at a local library and have also set about the task of creating my profile for washingtonpost online and dailywriting tips of whom have asked to write for them for pay. I am wondering is my reputation going so strong that they want me. has any writer out there been asked for those unique opportunities. I also just sent some info over to Demand studios and livestorng. so I just have to kick my heels back and play the waiting game to see if I am hired by them. There of course, will be other avenues I can stroll down, doors still to be knocked upon. This is just a start .